Andover, Kansas. 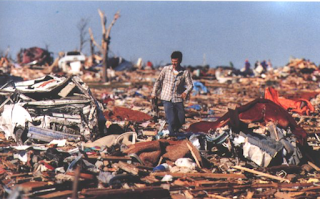 The death toll of 17 seemed high to some but the Centers for Disease Control did its first-ever comprehensive study on tornado morbidity and found the warnings likely saved 77 lives. I believe that was the first-ever study that proved warnings saved lives in a particular situation. Tornado damage in Andover. Courtesy: NWS. If you view the video, keep in mind that there were two tornadoes in progress simultaneously in Sedgwick Co. (the county that contains Wichita) and, at about the end of the newscast, a third (F-4) tornado formed in the southern part of our viewing area. 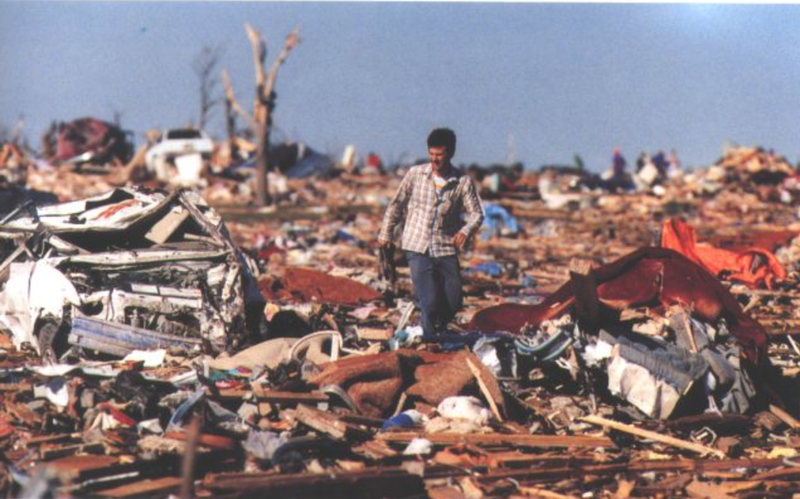 In 1991, bringing in a second meteorologist to help on air just wasn't done. As you can imagine, it was an extremely stressful situation. Other than in the evening, I do not know the details of the Andover commemoration as it is still being planned. I just wanted to give you this heads-up in case you are interested in attending. If you are interested in learning more about this tornado, go here. I remember this day very clearly. I had just got home to Med. Lodge from KSU for the weekend. We had you on the TV with the volume turned up, standing on our deck on the east side of town watching this massive anvil thunderstorm. My future wife was headed down the turnpike for a friends wedding, and had to take shelter at ElDorado. Thanks for everything that your profession does! I was in this one. Hard to believe it has been 25 years. A day I'll never forget. Thank God for KFDI live weather reporting that day - saved us!